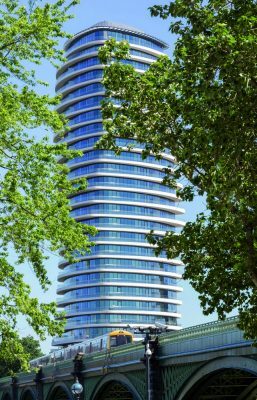 Award winning architect, Patel Taylor, reveals its latest contribution to London’s riverscape, Lombard Wharf. 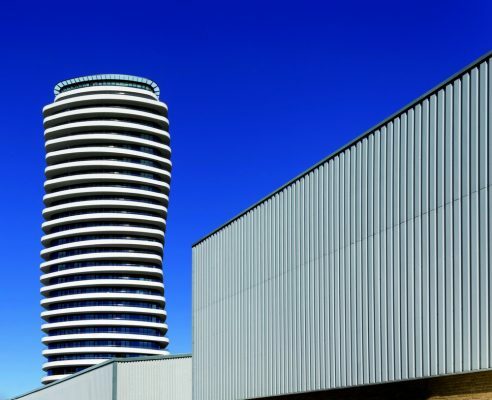 Designed for Barratt London, the impressive development sits on one of the last remaining riverfront sites in the London Borough of Wandsworth, south London. 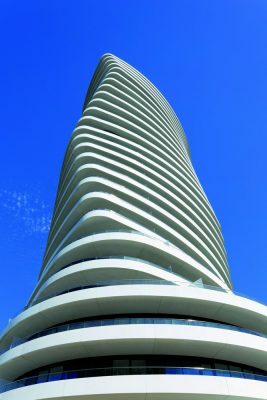 The building, with a distinctive tear-drop shaped plan, appears to twist as it rises, thanks to subtle changes in the positioning of the white precast-concrete balconies. This creates a kinetic appearance which belies the use of repeating modules, giving the impression that the freestanding structure is carved out of stone. 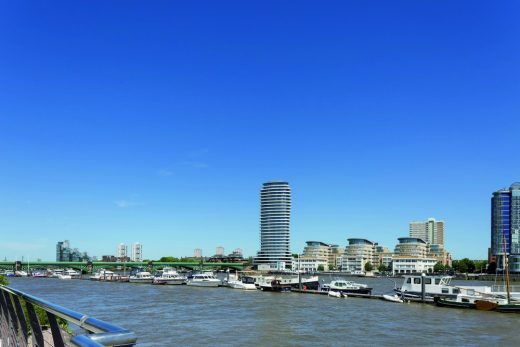 Lombard Wharf is located on York Way, neighbouring smart Battersea Square. 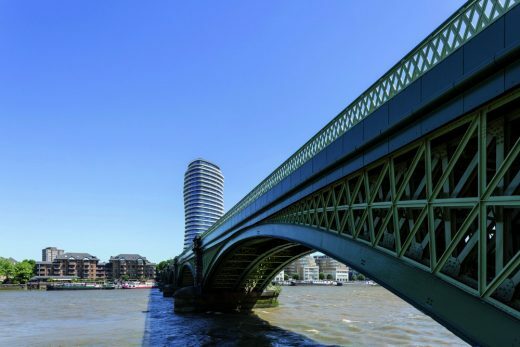 The 28-storey building comprises 134 one, two, and threebedroom homes, alongside a newly planned footbridge and part of the Thames path. By creating an elegantly unusual form and opening up the surrounding area and public realm through an imaginative approach to landscape, the development has been praised by Wandsworth Council for its flattering and unique design. By giving the building a curved form, Patel Taylor has grounded it in its site, creating a sense of place. This is enhanced by the opening up of two adjacent railway arches, also part of the Patel Taylor scheme, one of them containing a workshop space and the other a pedestrian footpath, linking two sides of the railway line. 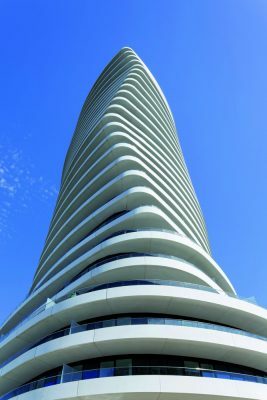 The wraparound balconies are ingeniously designed to rotate by two degrees maximising views from the residences. From a distance, they dominate the appearance of the building, creating a dynamic yet monolithic sculptural form signalling a point of significance in the landscape. At night, the building’s balcony fronts are lit with LED lighting, tracing its shape in the skyline. 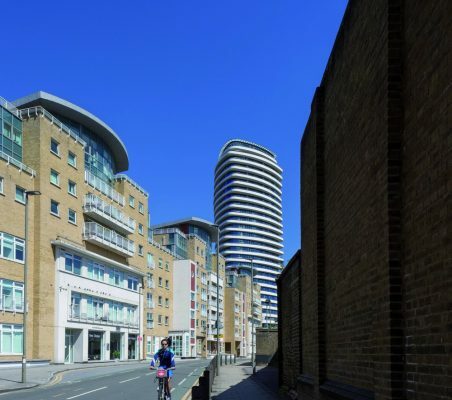 Ed McCoy, sales director of Barratt London, commented: “The distinctive and graceful design of the building, its location, and its proximity to Clapham Junction have made Lombard Wharf a popular choice for buyers looking to move into or invest in Battersea. The building is a great addition to this area of the riverside. “Facilities for residents include a fitness suite, secure cycle storage and 24-hour concierge service. Affordable housing is located in the lowest four floors, with remaining homes for private sale. 5th August 2015 – Barratt London’s Lombard Wharf, a residential tower with an elegantly twisting sculptural form designed by architects Patel Taylor, has been granted planning permission. Work can now begin to construct this distinctive new addition to the Thames waterside. 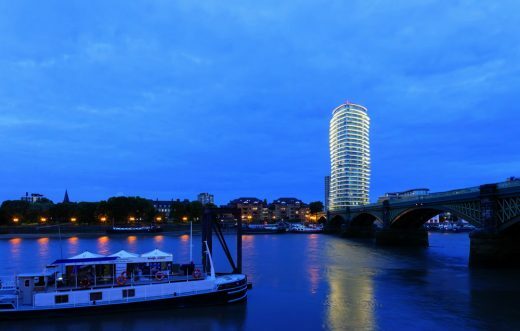 An example of outstanding architecture, Lombard Wharf will make a positive and dynamic contribution to the capital’s skyline. The building’s unusual ‘plectrum’ form, both marks and guides pedestrians to the riverfront, through a new landscaped public plaza and waterfront promenade. 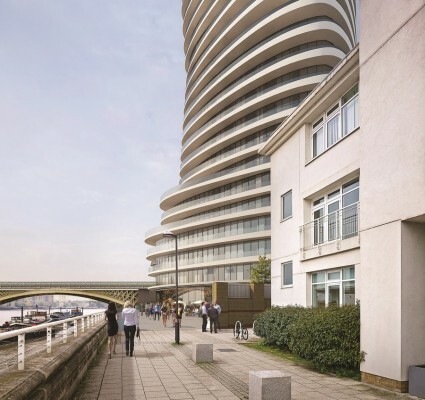 Extending over 28 storeys in order to maximise the slender character of the building, Lombard Wharf’s unusual ‘stacked’ form conceals three traditional tier elements, a base, a middle and top. The ground floor and mezzanine level comprise the base. An impressive double-height glazed residential lobby, with neighbouring retail element to the west, spills out onto a generous new public plaza at ground level, maximising visual links to the river. The mezzanine level contains a second floor to the retail unit together with a gym for residents, staff facilities and management welfare facilities. The middle tier contains the residential units of the building, comprised of a mix of one, two, and three bedroom homes. 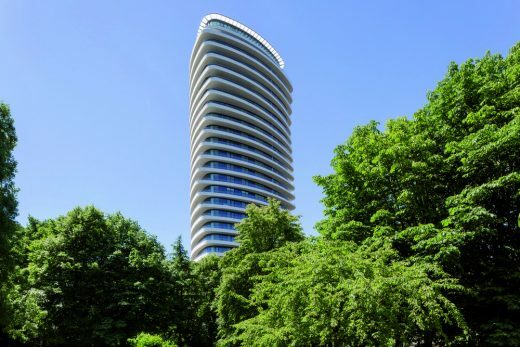 The majority of residencies are dual aspect, due to the oval nature of the building, allowing natural light to flood into the living spaces and affording views of the river and nearby park. 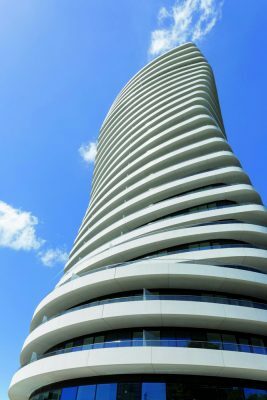 Rotated at an angle of two degrees, residents will enjoy wraparound balconies that lend the building a dynamic sculptural profile and appear as an illusion of ‘rotating discs’. 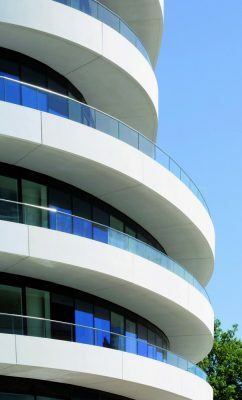 This optical twist is achieved by means of diagonal lines created by tapered solid balustrades, jutting against the horizontal lines of the balconies. This complex, yet elegant, variation creates a fluid shimmering illusion of movement and interest in this waterside setting. Oriented to the north-west the building’s minimal ‘plectrum’ shaped footprint, is designed to maximised the available provision of public space at the base of the tower. 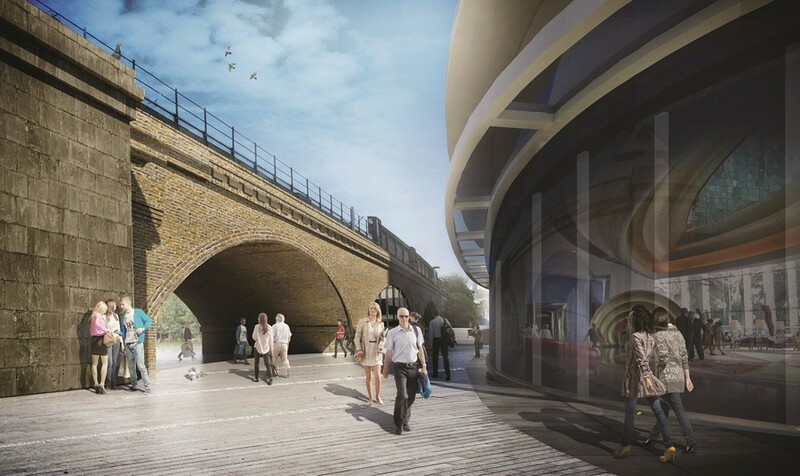 The design of the landscape stitches together the fragmented riverfront and extends the Thames Path to provide a legible link to Battersea High Street and Clapham Junction. Comprising high quality granite paving, external lighting, trees and planting, as well as play areas and an outdoor terrace. This public space will enjoy views towards the river and animated retail frontages spilling out onto the plaza, to develop a sense of community and place. Lombard Wharf occupies one of the last remaining riverfront sites in Wandsworth and is lies adjacent to the Grade II* listed Cremorne Bridge. 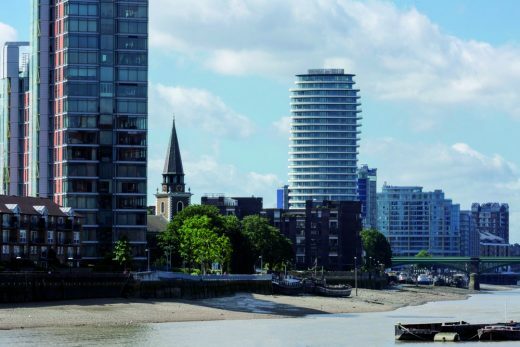 This combination of new homes, exemplary design and generous public realm, will work together to create a new destination for Wandsworth, drawing people towards and reconnecting the local community to the riverfront. Patel Taylor is a London-based architecture practice led by Pankaj Patel and Andrew Taylor. Founded in 1989, the practice’s work ranges from city scale planning and urban landscapes, to leading residential, mixed-use and workplace developments, education and cultural buildings. Patel Taylor’s work reflects a view of design as a process embracing the historical and social dimension of places as well as their visual and aesthetic context, enhanced by material and craft. The practice is involved with some of the largest urban regeneration schemes in the UK including two new mixed-use buildings on the Southbank, and London masterplans for Wembley, Earls Court, White City and Wapping. In Birmingham, Patel Taylor completed the City’s first urban park in 130 years, Eastside City Park in 2012.